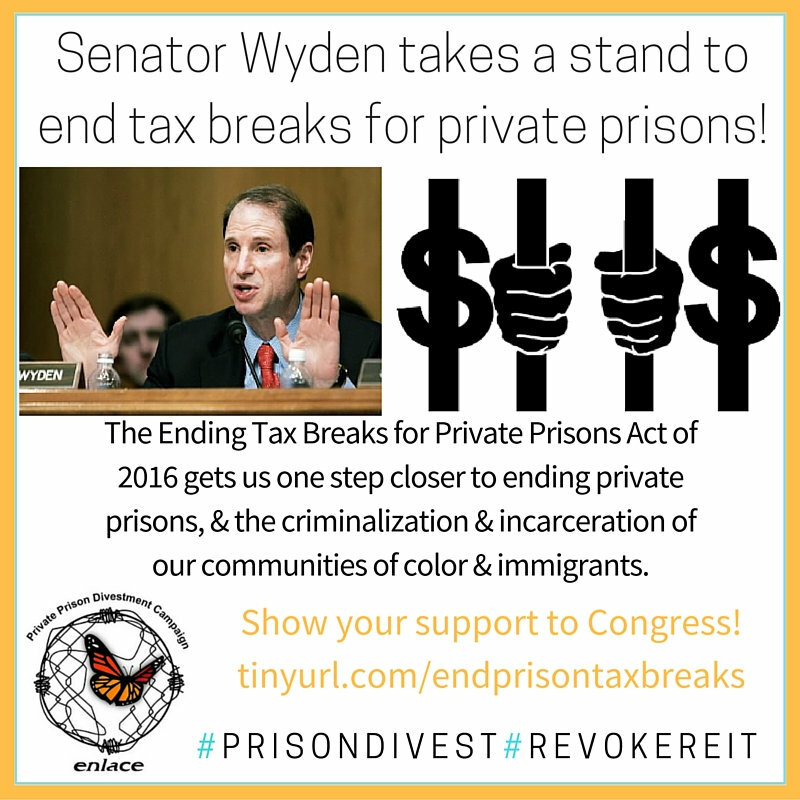 Senate Finance Committee Ranking Member Ron Wyden, D-Ore., today introduced legislation that would limit the ability of private companies that operate prisons to take advantage of special tax rules for Real Estate Investment Trusts (REITS) — U.S. corporations that invest in real estate. The Ending Tax Breaks for Private Prisons Act of 2016 would significantly weaken the for-profit prison industry, and free up millions of dollars that could be reinvested in services that actually keep our communities safe. In 2013, the IRS classified Corrections Corporation of America (CCA) and GEO Group as Real Estate Investments Trusts (REITs), based on the companies’ claim that income received from local, state, and federal governments to incarcerate people was “real estate” income. The legislation introduced by Senator Wyden would clarify that much of this income is not in fact eligible for REIT status, as it goes towards operating costs like prison guards, healthcare, and food, not real estate. Corrections Corporation of America and GEO Group reported income of over $3.6 billion in 2015, almost all of which was tax free due to their status as REITs. The National Prison Divestment Campaign, convened by Enlace, began pushing to revoke prisons’ controversial REIT status in 2015, and has since gained widespread support from a public that is outraged by the targeting of Black and brown communities by local law enforcement and Immigration and Customs Enforcement (ICE), and the sprawling incarceration system that private prisons operate within. The Prison Divestment Campaign was convened by Enlace in 2011 in response to the role that private prisons play in the expansion of criminalization and incarceration of immigrants and people of color in the United States. The campaign has over 200 endorsers who represent immigrant, Black, LGBT, labor, and community groups.